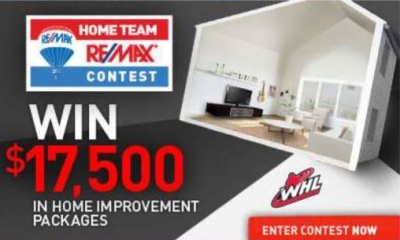 RE/MAX Home Team Contest - Win $17,500 in Home Improvement Packages! Posted on Monday, March 28th, 2011 at 4:18pm. If you're getting ready to buy or sell your home this spring, you definately don't want to miss out on our latest contest. We have four prize packages to be won! Don't forget to check out the latest North Vancouver, West Vancouver and Vancouver listings. Imagine renovating that dated bathroom you've been meaning to get to... or maybe you've had your eye on a new LCD TV or dining set for your new pad? The possibilities are endless! To enter the RE/MAX Home Team Contest fill in the entry form for your chance to win one of four incredible prizes including CASH, The Brick Gift Cards and an All Weather Windows Package. One (1) $5,000 RE/MAX Home Improvement Prize which entitles the winner to $5,000 in cash courtesy of RE/MAX of Western Canada. One (1) $2,500 The Brick Package which entitles the winner to a $2,500 Brick Gift Card. Gift Card has no cash value and has to be given at time of purchase. One (1) $2,500 All Weather Windows Package which entitles the winner to a $2,500 gift certificate. Second Prizes (x2): Two selected winners will each win one $2,500 The Brick Package. Each of The Brick Packages consists of one $2,500 The Brick Gift Card. Third Prize (x1): One selected winner will win one $2,500 All Weather Windows Package. This package consists of one $2,500 gift certificate. Contest closes on April 30, 2011, for further details please visit RE/MAX for Rules and Regulations.